Anyone knows about this ? Using firefox fhere's sound from youtube but soundcloud is as silent as it can be. firefox does not even start to play the soundcloud piece and as such does not show up in pavucontrol. Any fix for this ? Does it work in Chromium? I've never installed it and I'm not sure if it constitutes a valid troubleshooting tool. So far this new system is lean so I'm not tempted to crowd it. Also, if it works in it then the reasoning could fall into something like: well, use it then and forget firefox. So far I'd prefer knowing why it does not work and trying to fix it. There must be a reason. I still have LM 18.1 around in which firefox plays soundcloud very well as I've uploaded many pieces to my soundcloud account using that Linux Mint system. If you have a technical insight on this let me know. I believe there's a gstreamer plugin you need for that but I don't remember which, see if the are any you don't have. jonetsu wrote: Anyone knows about this ? Using firefox fhere's sound from youtube but soundcloud is as silent as it can be. firefox does not even start to play the soundcloud piece and as such does not show up in pavucontrol. Any fix for this ? Do you have an interface with more than 2 outputs? Then you need channels=2 in module-jack-sink, else Pulseaudio freaks out with Soundcloud because it tries to do strange surround sound things and fails. bluebell wrote: Do you have an interface with more than 2 outputs? Then you need channels=2 in module-jack-sink, else Pulseaudio freaks out with Soundcloud because it tries to do strange surround sound things and fails. Yes, there are 8 outputs to the 1010LT audio card. Although I never tweaked that channels parameter in the jack sink before. If I dual boot to the previous LM 18.1 system, soundcloud will work just nice in firefox. In this case here firefox itself will not output anything at all from soundcloud. From youtube yes, but not soundcloud. So since it works with youtube then the problem is not with the sink, as far as I see it. sysrqer wrote: I believe there's a gstreamer plugin you need for that but I don't remember which, see if the are any you don't have. 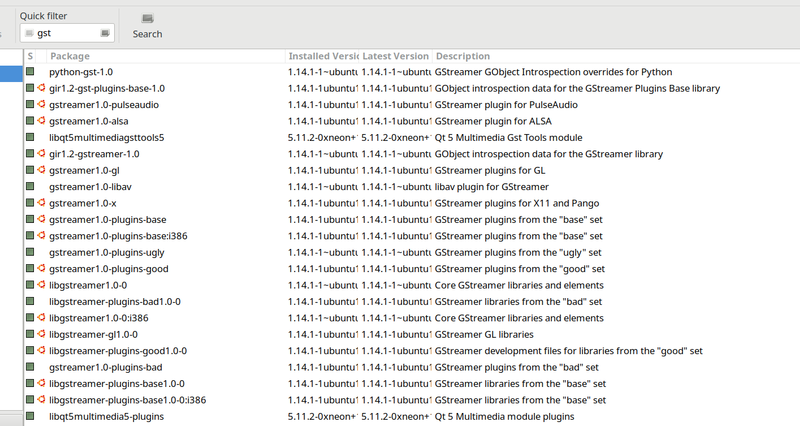 gstreamer is installed but then, there are a lot of gstreamer packages available. I'm not inclined to install them all out of not knowing which additional one would be needed. Thanks, I'll compare with what's installed. I'll install the ones that are absent one-by-one so that it could be possible to pinpoint which one does it. Maybe. My (and other people's) problems were similar: strange balance with Soundcloud (one channel louder than the other, Pulseaudio outputs to 3(!) channels), but NO problems with Youtube. I am no Pulseaudio expert. Maybe Pulseaudio can be tweaked. Just watch pavumeter when playing Youtube-videos and Soundcloud-clips. Maybe you can see the different channel routing. If it doesn't play at all (as opposed to playing but being silent) then it is a codec issue. You can try running firefox from a terminal to see if there is anything suggestive there. Do you have the same problem with bandcamp? There are a few suggestions I've seen that say you need to install ffmpeg, might be worth a try. I've seen 'Audio IPC Server' on my Arch system. It's a generic name for JACK, which does indeed provide Inter-Process Communication, or IPC. I don't use Pulse Audio but if the dialogue says 'JACK sink' -- a sink is an output? That would imply the version of Firefox you have has been compiled with JACK support. Is JACK started? What happens if you stop JACK? The solution for me was to play back a youtube video for a short time, then pause it. Now play back soundcloud. Youtube starts Firefox's Audio IPC server (known to most people as Firefox's JACK client ) and soundcloud can use it. merlyn wrote: I've seen 'Audio IPC Server' on my Arch system. It's a generic name for JACK, which does indeed provide Inter-Process Communication, or IPC. I don't use Pulse Audio but if the dialogue says 'JACK sink' -- a sink is an output? That would imply the version of Firefox you have has been compiled with JACK support. Is JACK started? What happens if you stop JACK? No, there's no need for any application using PA to be compiled with jackd support to actually go through jackd. Hence the sink. The application happily uses PA w/o knowing that PA in turn goes to jackd. It does not need to know after all. As I've mentioned, the LM 18.1 system in dual boot plays soundcloud fine using firefox and it has the same PA/jackd configuration that I've been using for years now. sysrqer wrote: If it doesn't play at all (as opposed to playing but being silent) then it is a codec issue. You can try running firefox from a terminal to see if there is anything suggestive there. Do you have the same problem with bandcamp? There are a few suggestions I've seen that say you need to install ffmpeg, might be worth a try.